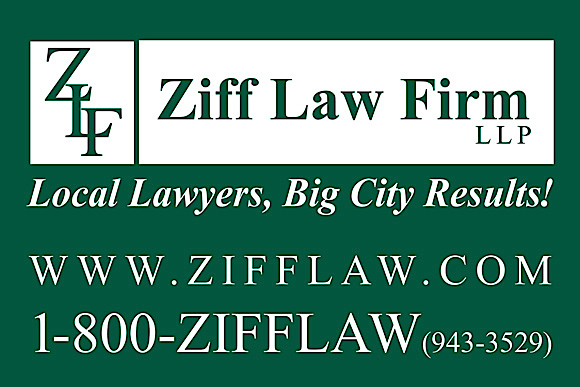 To reach the Ziff Law Firm website, click on the ad below. In his new column, Jim Reed urges motorists to come up with a plan ... just in case. Spring is a great time of the year in Schuyler County. The days are longer and getting warmer, and Seneca Lake is awakening after its winter nap. It's also a time when more motorists are on our roads, and after months of tightly clenching our steering wheels on snow and ice, we're driving a little faster and being less cautious because the roads are (mostly) clear. There's never a good time to let your guard down, though. The longer you're a driver, the more you tend to slip your driving into automatic pilot and get distracted. It's a bad habit and we all do it. So, here's a reminder: Always drive like your life, the lives of loved ones, and strangers on the road with you are in danger because a vehicle crash can happen at any time and to anyone. Drive defensively and limit your distractions at all times, and establish a plan for what happens if you have a crash. As a personal injury attorney handling car crash cases in New York and Pennsylvania, I know the devastation that can quickly happen on the road. If you are involved in a crash that causes personal injuries or serious property damage, there are many complicated issues concerning fault and recovery. It is best to consult an experienced personal injury attorney quickly if you are involved. My experience has given me a perspective and knowledge about what people should do in the critical minutes after a vehicle crash. First, it is extremely important to do three things after a serious crash if you are physically able. You must stay on the scene, aid the injured, and call the police. It's also important to document what happened. My law firm has a free app for that. Be prepared and protect yourself and your loved ones with the Ziff Law Crash Help App for iPhones and Androids. The app's automatic car crash detection system uses internal sensors in your smartphone to detect a crash and automatically sends a help message with your location to the emergency contacts you selected, if it is enabled. It also has a camera, time-saving forms, a GPS locator, and more. In the disorienting moments after a crash, if you are able, become a good reporter and gather as much information as you can to strengthen your case. Write down the details of your crash, noting the time of day, weather, and road conditions. Make a diagram of the crash. Note the location of the vehicles, crosswalks, stop signs and traffic signals. Mark the location of any skid marks and note their length. You must exchange information with the other driver and be sure to get the following: The other driver's name, address, phone number, driver's license number, insurance company name, and the policy number. Ask the other driver if they are the owner of the vehicle. If not, you must get the name, address, phone number, insurance company and policy number of the vehicle's owner. It's pretty common knowledge that you should exchange information with the other driver. But did you consider passengers and witnesses? You should get the names, phone numbers, and addresses of all passengers and any witnesses to the collision. Take photos of the damage to your vehicle before you have it repaired, as well as any visible injuries you or your passengers suffered. If you are a good reporter after a crash, the information will help your attorney protect your rights. Because witnesses forget details, the better a record you keep -- and the sooner you get the help of a personal injury lawyer -- the better. And one last tip: make sure to notify your insurance carrier of your crash so they can set up a claims file and advise you of next steps in resolving your claims for damage to your vehicle, as well as your medical bills and lost wages. 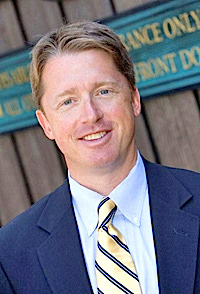 Photo in text: Attorney Jim Reed.